THERE is no better way to break the fast than by drinking Zam Zam water and eating sweet dates, which makes Westin Kuala Lumpur stand above the rest this Ramadan month. As one of the first hotels to offer Zam Zam water, Westin takes pride in serving their patrons something extra special this fasting month. “We were the first to start serving Zam Zam water in 2009 and it has been adopted by others since,” restaurant manager Shahrul Efendy Shukur said. The Living Room, serves up mouthwatering dishes in the midst of Arab decorations and traditional music to ease people into the mood of the holy month. The culinary team will serve up some of Westin’s signature dishes as well as briyani, Pulut Rendang Udang, various hot gulai and Western favourites. Some of the items include Nasi Ulam Seratus, Keli Leleh Sungai Pahang, Ayam Panggang Pedas Pucuk Paku, Rojak Buah Hentian Pagoh, Kerang Rebus, Baked Whole Lamb, Stir Fried Asparagus, Taste Olive and Three King Mushroom, tacos and Ikan Merah Panggang. According to Malay kitchen chef Hamdan Ahmad, the team had paid attention to every little detail to ensure the dishes were just right. 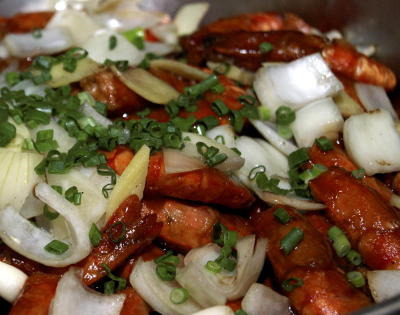 Irresistible: The Wok-Raked Beef with Green Leek Stick dish is a culinary delight. “We have four types of rice, briyani served with acar; Nasi Dagang with acar, kerepek ikan and ikan tonggol; Nasi Lemak; and Nasi Ayam, where the chicken is roasted not steamed. “At the tandoori station, we make the naans and tandoori fresh from the oven and our soup station offers rasam, Soup Buntut, tom yam, Sai Yong Choi and mushroom soup. “Diners will be able to sample a little bit of everything,” Hamdan said. “We have a special kuali tebal (wok ) section which serves up hot Rendang Paru, Ikan Masin Masak Lemak Nenas, Ayam Kari Nangka and Sambal Goreng Jawa,” he added. A must-try is the briyani which is close to authentic, flavourful and not too oily. The Pulut Rendang Udang also offers a twist to the traditional favourite while the Roti Jala served with mango chutney, chicken floss and curry gives a sweet and spicy taste. The Kuali Tebal dishes like the Kari Ayam Nangka and Sambal Goreng Jawa are spicy and go well with rice. For those with a sweet tooth, the dessert section offers everything from ice kacang and tropical fruits to puddings, Indian sweets, Nyonya kuih and even cookies. 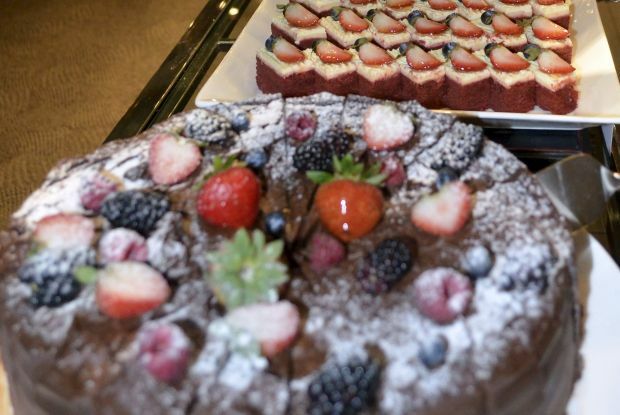 “We understand that our diners love desserts, so there is a special station that offers patrons the best local and Nyonya kuih, puddings, cakes, baklava and fruits,” he said. The buffet is priced at RM108++ per adult and RM54++ per child available from 7pm to 10.30pm until 18 August. For those who love have shisha, there is Shisha Galore @ Splash priced at RM15++ each, inclusive of Arabic sweets.